On Saturday, 14th October twenty six (26) Karts took to the Formula K circuit for the last round of the championship, in the hope to improve laps times and win heats to seal victory in the championship. The majority of the classes in club championship where still undecided going into this last round. The DD2 and 60cc junior classes also scored points in the EP / Border Regional Championship. A moderate to fresh north-easterly wind caused increased wind resistance on drivers and karts at certain sections of the circuit, which required drivers to adapt very quickly. 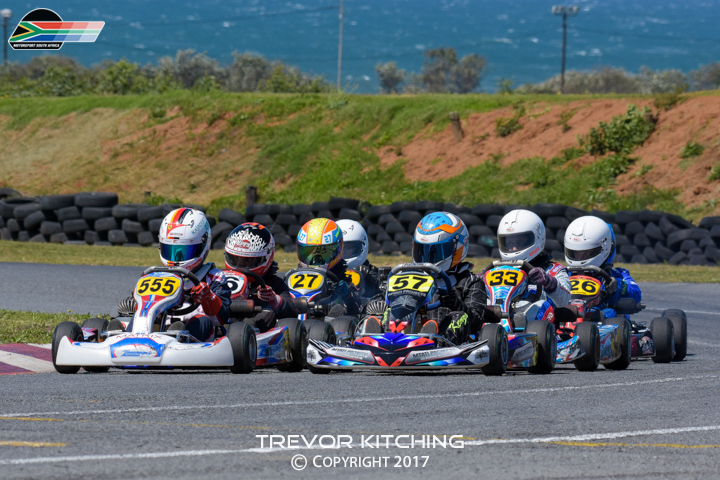 Algoa Karting Club was represented by Bryn High (DD2), Murray Gil (DD2), Kiesha Potgieter (60cc) and Kenzo Barnard (60cc). 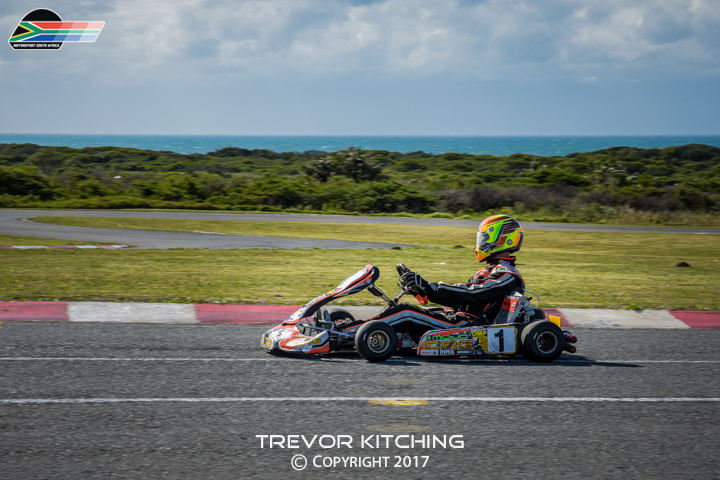 Our Queenstown based driver, Kyle Heideman (Clubman’s Class C), also made the long trip to East London to compete in the championship. Even though the wind never abated, the superb racing produced by all classes did not disappoint the sizable crowd of spectators that spend the day with the Karter’s. The DD2 gearbox class had spectators on their feet every heat with the leading drivers changing race positions up to three times in the same lap. Cadets 50cc: 1st Redd Scholtz, 2nd Jordan van der Merwe, 3rd Heath Vallance. Scholtz won all three heats, earning him valuable points, Vallance and Van der Merwe never gave up and kept the pressure on waiting for Scholtz to make a mistake. Junior 60cc: 1st Sebastian Smith, 2nd Kenzo Barnard, 3rd Jordan van der Merwe, 4th Kiesha Potgieter , 5th Red Scholtz, 6th Kaylim Padayachee, 7th Jordan Dorning, 8th Daniel van Zummeren, 9th Heath Vallance. Smith had a superb day, winning all three heats, he also bids farewell to the 60cc junior class, and we look forward to see him competing in the bigger engine class next season. Padayachee, had some misfortune on the day and could not finish higher up on the day, but is still looking strong in the championship. This class is without a doubt very exciting to watch producing close racing and good lap times. These young drivers and their parents put an enormous effort in to produce such good racing, each individual driver can be very proud of their achievements this season. Class A: This is the spot every driver wants to occupy. 1st Shaun Gradwell, 2nd Geoff Stephen, 3rd Richard Clarke, 4th Kevin Vosloo, 5th Brent Strydom, 6th Craig Borges, 7th Murray Gil, 8th David Burberry 9th Jared De Kock, 10th Bryn High. Gradwell and Stephen provided hair-rising racing action, without incident, and with full commitment and no backing- out when entering corners. 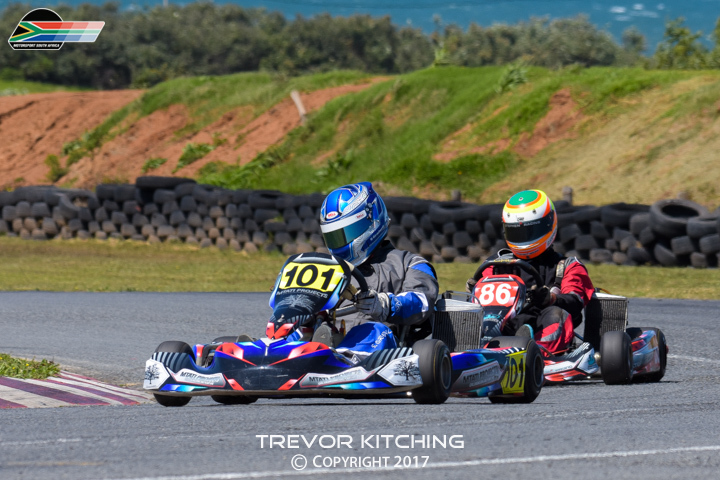 Border Karting will honour their 2017 club champions at a gala event on 8th of December.